Your identity can be stolen when someone uses your personal information such as your name, Social Security number, credit card number or other identifying information, without your permission to commit fraud or other crimes. Identity theft is a serious crime. People whose identities have been stolen can spend months or years – and their hard-earned money – cleaning up the mess thieves have made of their good name and credit record. In the meantime, victims may lose job opportunities, be refused loans, education, housing or cars. 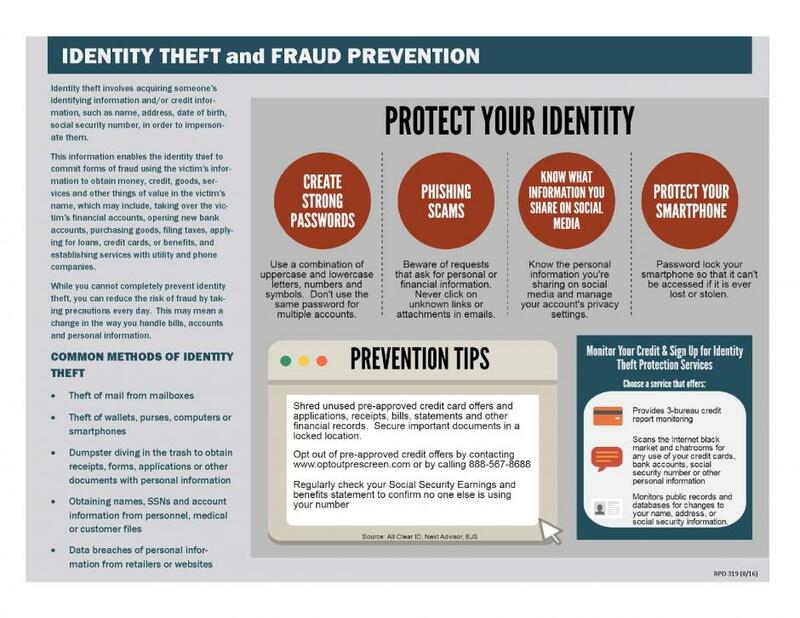 The Rocklin Police Department Investigations Unit has assembled information from various sources and put it into the format of a flyer that you can use as a guide in case your identity has been stolen. 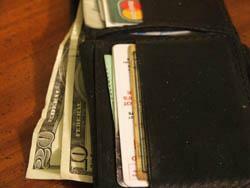 For tips on identity theft prevention, visit consumer.ftc.gov. Swindles and confidence games have been with us since man first put pen to papyrus. With the advent of the computer age, swindles have become highly sophisticated, universal and continuous. The Rocklin Police Department’s Investigations Unit is constantly finding new scams being forwarded to local residents. Currently, bogus letters supposedly from banks or individuals about unclaimed funds top the list of scams. Often these letters play upon your sympathies for people from third world countries or seem plausible requests for help. But, beware! These are scams by people trying to get your money or to gain access to your bank account or credit card information. Do not respond to them, do not send money, and above all, do not give out any personal information. Just remember: if it sounds too good to be true, it usually is! If you are the victim of a scam, please contact the Police Department at 916.625.5400. I am MICHEAL XXXX, Telex/Money transfer Director of Nigeria apex Bank (Central Bank Of Nigeria). Since my assumption of office on appointment by the present Democratic Government, I have been able to ream the image of this Nation by offsetting most over due contract sums owed by the Federal Government of Nigeria to foreign contractors in the past years. On the process of these payments, I discovered through investigation that my predecessor attempted to move out the above-mentioned sum outside Nigeria but was unable as he was removed out of office unaware. Now, I have concluded all necessary arrangements for the smooth transfer of the money to your account on trust. Contacting you on this issue became imperative owing to recommendations through an acceptance of your good integrity and trustworthiness as I came across in your particulars through a Foreigner who described you as an honest man. The fund originated from the balance of an over-invoiced sum of which the principal sum had been paid to foreign company that executed the contract some years ago. This fund has been floating in a suspense account with Central Bank of Nigeria (CBN)for a long period of time and I as the Director of Telex/Money Transfer Department of CBN in the course of my duty discovered this fund and decided to transfer it outside Nigeria through a trustworthy partner who will share the fund with me on 30% to 70% basis. Therefore, what is required from you is to forward in your confidential bank particulars where this fund will be transferred. As you will have 30% of the 22million US dollars after a successful transfer into your account abroad, part of my 70% will be used on importation of valuable goods and purchasing of cars through you in Nigeria. Note: that this transaction is risk free and will be concluded within 14 working days and the money be remitted into your account. Please contact me on this e-mail address(xxxxxxxx@xxxx.co.in.]. Also send me your telephone/fax numbers if you have. Also include your street address. Please if you are interested in this proposal, as well as if not, do not hesitate to let me know in time. We are glad to inform you, that in May all our clients have an amazing chance to use our new service. Why amazing? Because we are going to give you an amazing discount. Now you can easy deposit your credit card by Western Union transaction if you have indebtedness on credit. And we’ll add to your transaction 20% of its face value. Transaction amount must be not more then credit indebtedness. For example, if you pay us 8000$ (80%) – we’ll put on your credit card balance 10000 (100%). But we pay you first and in the next day of our transaction you pay us. The minimal sum of our payment: 2000$. It is a special offer, which works only in April – May (for our first clients).Hurry and receive the amazing discount.